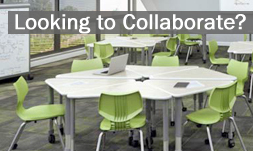 Collaborative desks that feature built-in dry erase tops, multimedia areas, odd shapes and a high degree of portability are perfect for National Inventor’s Month events. They allow students to problem solve together and express themselves in a way that is not possible with traditional, stand alone desks. Many of the collaborative desks come with comfortable, easy-to-clean, student chairs that match their coloration, shapes or other detailing. An innumerable number of inventions have taken place in the name of science. As such, it’s important to have a variety of science lab furniture available during the month as well. Items to consider placing in the classrooms are casework cabinets, safety stations, lab tables, clean-up sinks, lab stools, storage cabinets and complete workstations. Today’s manufacturers create lab furnishings that are safe for assorted age groups. Non-traditional, classroom and reception area furniture may also help stimulate the children’s creativity during National Inventor’s Month. One company that manufactures funky school furniture that kids love is Fatboy®. Adults that lived through the 70s bean bag craze era will likely appreciate the designer’s vision too. Their line of bean bag furnishings are bold, colorful, comfortable, lightweight and durable enough to withstand what the kids can dish out during a typical school day. To check out the items we mentioned above and other school furniture that’s ideal for sparking innovation in the classroom, please contact us. At Worthington Direct, we recognize the importance of building a perfect learning environment and can help institutions of all sizes achieve their goals.